Pale purple, pom-pom flowers top dense clumps of aromatic, grass-like green leaves. Edible leaves have a mild onion flavor. Edible flowers can be used as garnishes. Blooms mid- to late spring. Will produce new green leaves throughout the season. 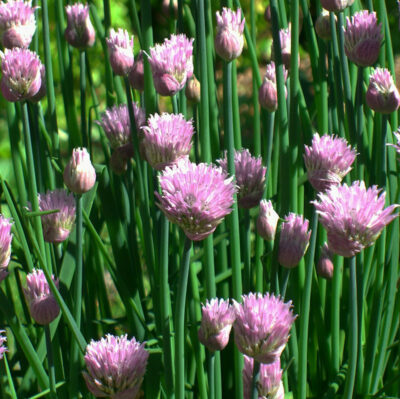 Harvest chives continuously (cut 1′ above soil) to encourage formation of new bulblets. One of the easiest herbs to grow in your garden. Full sun. Height 1-1.5′. Spread 1-1.5′. Drought tolerant. Deer and rabbit resistant. Zones 3-9.